Dangerous fake reproductions of this issue appearing first in 2015 are on the market. Forgeries of this issue are spreading! 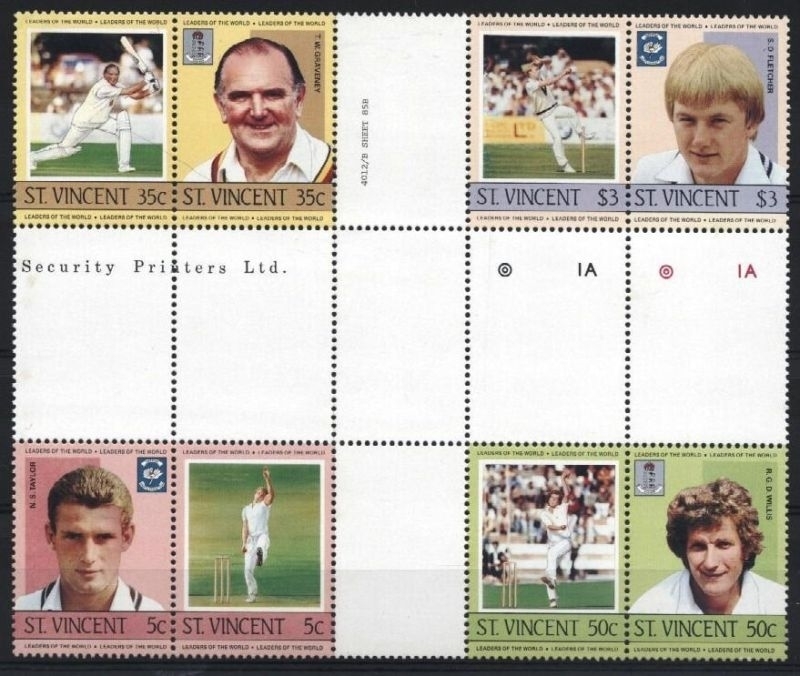 The Saint Vincent 1984 Cricket Players Forgeries. 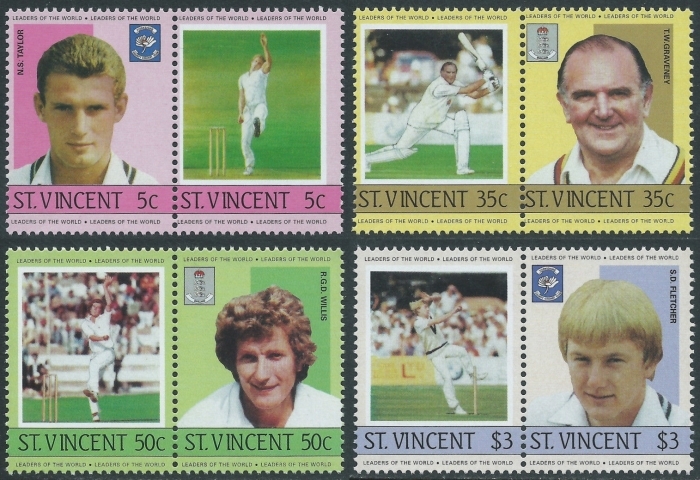 In 1985 Saint Vincent joined other commonwealth countries in the production and issuance of the Leaders of the World (LOW) Cricket Players series of stamps. Saint Vincent only issued one set of them in 1985. This page will try to clarify how many sets were issued and produced and what varieties were also produced. I will show examples of the varieties that exist including progressive color proofs, specimen overprinted varieties, imperforates and yes, made for collector errors and where possible, genuine errors. Through evaluation of the documents I have in my possession and the common practices of the printer, all sets of Leader of the World issues fall under the same consensus of quantities produced. We know that some issues for Saint Vincent were reprinted once. The standard was the same for all that 21,000 normal sets were reprinted for the Philatelic Distribution Corporation, (PDC). 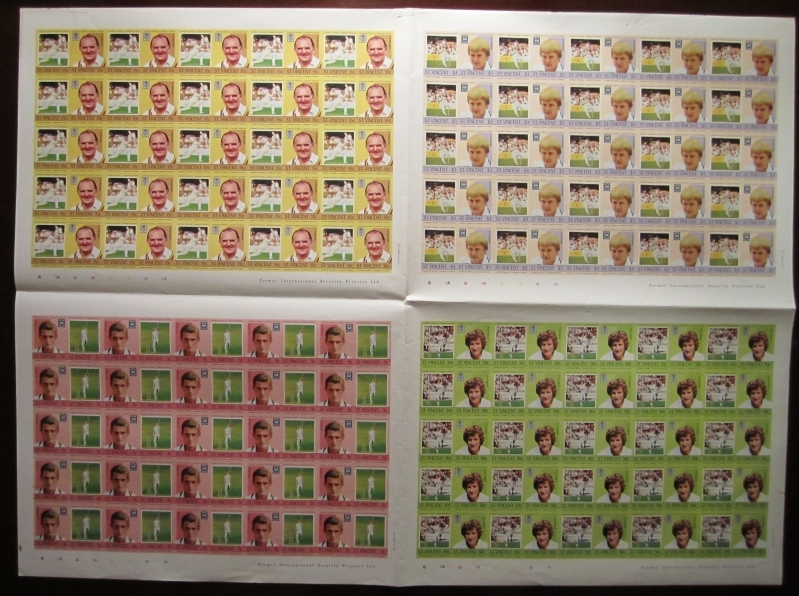 General invoices and documents show that original orders for many stamp sets outside the Leaders of the World Series and including the LOW series as well ranged from 15,000 to 25,000 sets for Saint Vincent. At that time the PDC had a set allotment printed for resale via outside stamp selling entities. The allotment was generally 2/3 of the given original orders. The calculation of 21,000 for Saint Vincent appears over and over and is an easy quantity to break down for the allotment. 21,000 went to the Saint Vincent Philatelic Bureau and 14,000 went to the PDC's outlets. So I will base on the higher figure that a total of 75,000 sets were produced for Saint Vincent. For Saint Vincent it appears no imperforates, color proofs nor errors exist for this issue. 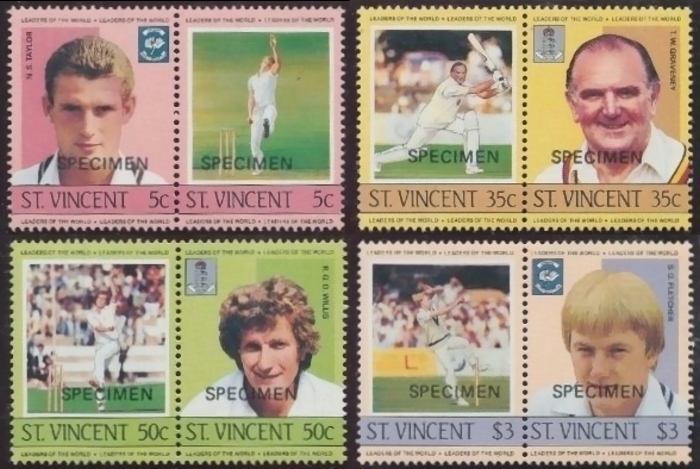 At present there is no evidence that any other varieties exist for the Saint Vincent Cricket Players issue. This concludes our study of the varieties produced for the Leaders of the World Cricket Players series issued by Saint Vincent. I hope that this clarifies the point that the stigma that millions were made of each issue is completely false and should be ignored by collectors and dealers of these issues. Because of a few biased and exaggerated opinions and written articles on these issues of which they have no evidence to back their claims the LOW stamp issues and varieties have been undervalued and shunned by many for years. Sometimes the "experts" are not such experts as they have not completed the research needed to verify their claims.